Not every Pole is familiar with kluski na parze, literally "dumplings on steam." This authentic Polish dish is always a treat to make when the weather turns cool. You can either beat the dough by hand until it blisters or use a stand mixer with a paddle attachment on medium speed for 5 minutes. 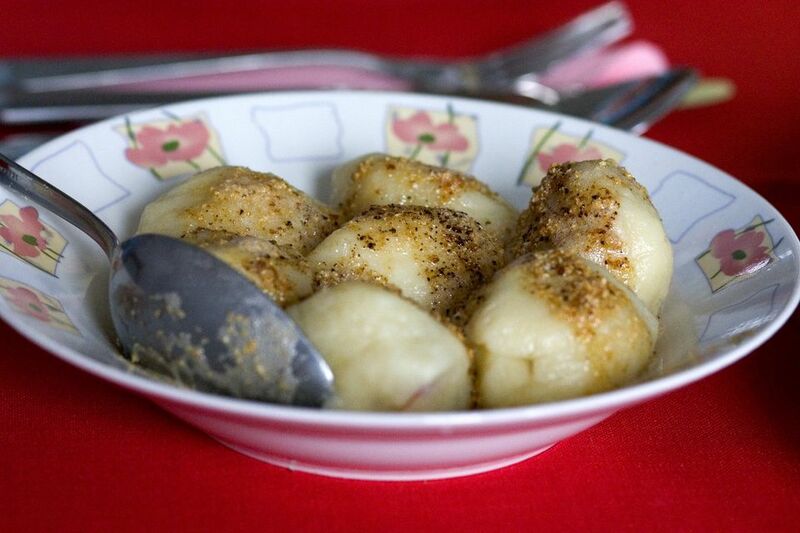 These dumplings can be served with meat and gravy (especially pork roast with onion) or sauteed in butter and sprinkled with sugar, or warmed and served with fresh fruit sauce. In a small bowl, make a sponge by dissolving yeast and sugar in milk and combining with 1/2 cup of the flour. The mixture should be the consistency of heavy cream. Cover and let rise until doubled. In a large bowl, combine remaining flour and salt, eggs and yeast mixture. Mix by hand or machine (the dough will be sticky) using the paddle attachment for about 5 minutes or until it blisters and pulls away from the side of the bowl. Add cooled melted butter and mix well. Let rise until doubled. Turn out onto a floured surface, kneading in more flour if too sticky. Pat out to a 1-inch thickness and cut with a 3-inch cutter or glass. Reroll scraps and cut again. Cover and let rise until doubled. Meanwhile, fill two large pots 3/4 full of water. Using butcher's twine, tie a circle of flour sacking or other lint-free cloth over the top of the pots and bring the water to a boil. Place as many dumplings as will fit on the cloth leaving 2 inches space between because they will grow. Place the lid on top of the pot and steam the dumplings for 15 minutes. Don't lift the lid during the steaming because the dumplings will collapse. Alternatively, place a splatter screen on top of the pot, place as many dumplings as will fit without touching each other and cover with an overturned heatproof plastic bowl. Transfer dumplings to a wire rack to cool. Store dumplings in a zip-top bag in the refrigerator or freeze. Warm dumplings in the pan juices of roasted meats or in gravy. For a sweet version, fry both sides in butter until golden, and serve sprinkled with sugar. Some also add cinnamon and yet others serve with stewed fruits or conserves.